Is the second time a charm? Raven Gates is trying her hand at finding love for a second time on The Bachelor franchise. She joined the Bachelor in Paradise season 4, which premieres on August 14 on ABC. If you want to know more about Raven Gates from Bachelor in Paradise, take a look at our Raven Gates wiki! There is love for everybody on Bachelor in Paradise, which is why Raven Gates has joined the cast after failing to win Nick Viall’s heart on The Bachelor in season 21. Although Gates managed to make it to the top two, Viall chose Vanessa Grimaldi. Gates thought she had a connection with Viall, but his connection with Grimaldi was stronger. 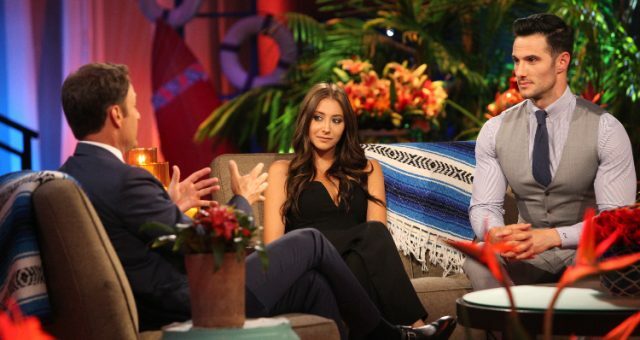 However, Gates did not give up on love and will now be on Bachelor in Paradise. Joining Gates in Paradise are her fellow season 21 contestants: Jasmine Goode, Lacey Mark, Danielle Maltby, Taylor Nolan, Kristina Schulman, and Alexis Waters. As one of the many fan-favorites on The Bachelor, fans are hoping that Gates finds love this time around. With the premiere coming up, keep reading for some interesting facts about Raven Gates from Bachelor in Paradise. Born on July 23, 1991, Raven Gates’ age is 26. The beautiful former Bachelor contestant is a very charming and enthusiastic woman. She is from the small town of Hoxie, Arkansas, that boasts a population of fewer than 3,000. Initially, not much was known about Raven Gates’ family, except that her parents were married for over three decades. Her father, Wes Gates, was diagnosed with cancer but in 2016, she revealed on Facebook that he is cancer free. He currently works at Hytol Conveyor in Arkansas. Gates’ mother, Tracy, is an elementary school teacher and principal at Hoxie Public Schools. The Gates family is a close knit one and Raven often uploads pictures of them together on Instagram. Before she earned fame on The Bachelor, Gates was a successful entrepreneur. She went to law school for a year when her father was diagnosed with lung cancer. Realizing her dream, she decided to open a fashion boutique, Grey Suede, with only $1,000 to her name. With her newfound fame, business must be good for the young entrepreneur! On Raven Gates’ Instagram account, there are still plenty of posts about her store. From the time she has appeared on The Bachelor, Gates’ followers increased to over 771k on Instagram alone. Where are all my queens at? Tag your #squad below! ???????? Finishing as runner-up, it is clear that there is something special about this 26-year-old beauty. Gates is a fun, lively, and good spirited person with a successful business. Before things got heated on The Bachelor, host Chris Harrison stated that Gates is a contestant to watch out for, saying, “Raven is a professional woman but from a small town. She is from Arkansas and went to the University of Arkansas. She is a very straight-shooting, no-nonsense Southern belle. She has a very sweet quality to her, and she is friendly to everyone, but she is sharp as a tack and will not be walked all over. I dare you to underestimate her. Some of the girls will learn that lesson. She is around fashion and clothes as a boutique owner. She is always ‘put together’ and dreams of the big country wedding. She does fit that stereotype. She is very kind, loving, and sweet, and Nick finds that very attractive. He very much enjoys being comforted by her. She is that girl who makes him forget and relax and takes him away from all the nonsense in the house, and that girl is always someone you have to watch out for on The Bachelor.” We all know that she narrowly missed her shot at finding love, but that does not mean that she gave up hope! @whitneyfransway is showing me around Malibu today! Though now a reality star, the brown-eyed beauty is still the same fun loving person she has always been. According to her ABC bio, Gates’ favorite movies are Step Brothers, Bridesmaids, and Uptown Girls starring the late Brittany Murphy, her favorite actress.